For the first time in Hong Kong, the work of more than a dozen influential artists from the Middle East will offer a rare glimpse into the contemporary Arab and Iranian art worlds. 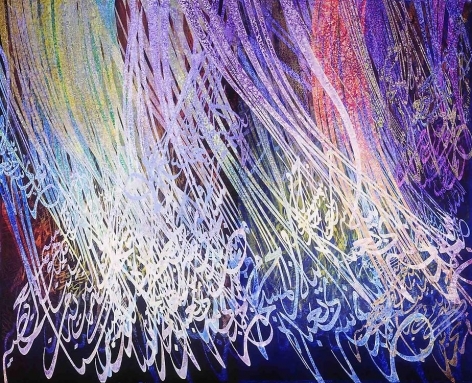 Written Images: Contemporary Calligraphy from the Middle East, curated by noted art historian Karin von Roques, explores the role of traditional Islamic calligraphy and symbols in the contemporary Middle Eastern consciousness. 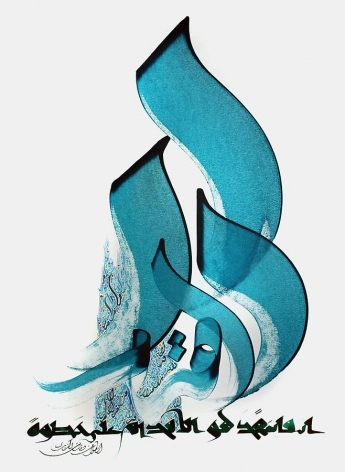 Arabic calligraphy in all its aesthetic and linguistic complexity is little understood beyond the Middle East and often regarded as an historical art form belonging to the classic Islamic arts. 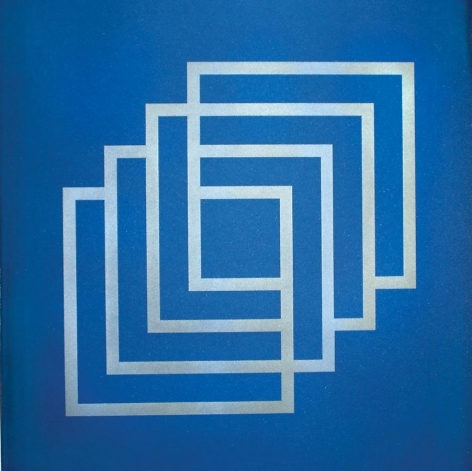 Yet it plays an important role in contemporary Arab and Iranian art. 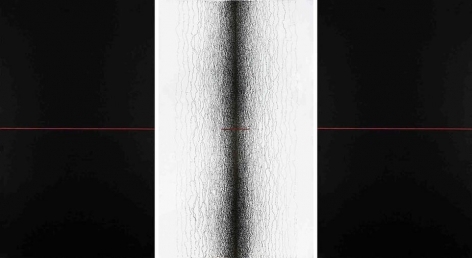 Artists including Egyptian Ahmed Moustafa, Iraqi Hassan Massoudy and Tunisian Nja Mahdaoui were among the first to look at writing from an entirely new perspective and reposition calligraphy in the contemporary context. Dr. Moustafa’s research is based on mathematical and scientific foundations that form the origins of Arabic characters, such as the proportional systems that were developed in the 10th century. For him and the other artists in this show, writing is more than the legible word; they use it as a pictorial, formal element, referencing a multitude of issues—religious, social, political and personal. 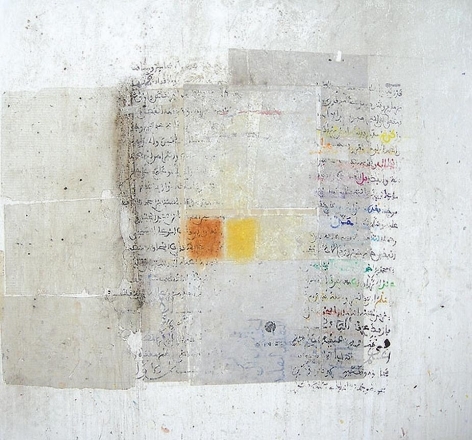 Working with different media, including paint on canvas, collage, ink on paper, gold leaf and silkscreen, these artists take traditional Arabic script and symbols as their point of departure. 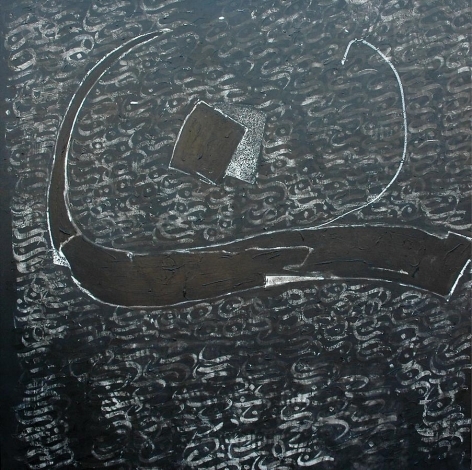 Qatari artist Yousef Ahmad distills Arabic letters into abstract shapes and gestural marks that sweep across dreamlike mixed-media surfaces. 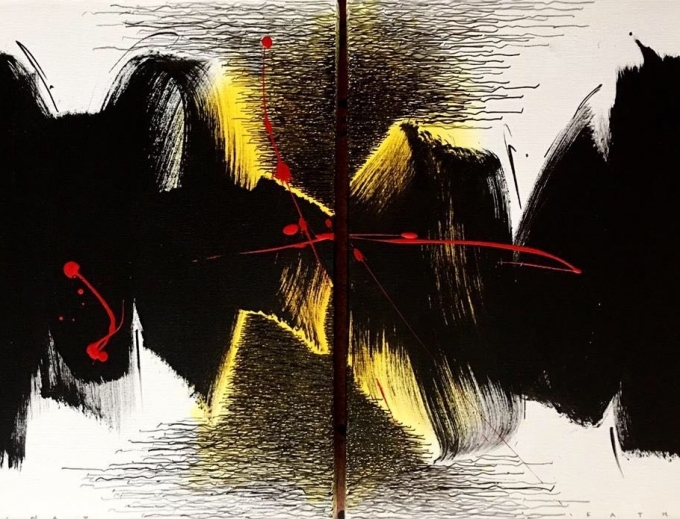 Syrian artist Khaled Al-Saa’i is inspired by poetry and Sufi philosophy, and paints spacious landscapes in which words float, overlap and follow their own particular rhythm. 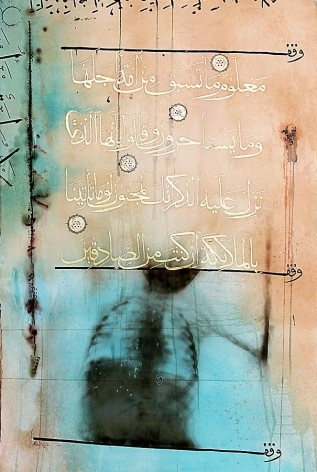 Offering a nuanced view of Middle Eastern culture, these innovative artists create complex contemporary works that draw on the spiritual depth of ancient Islamic art. 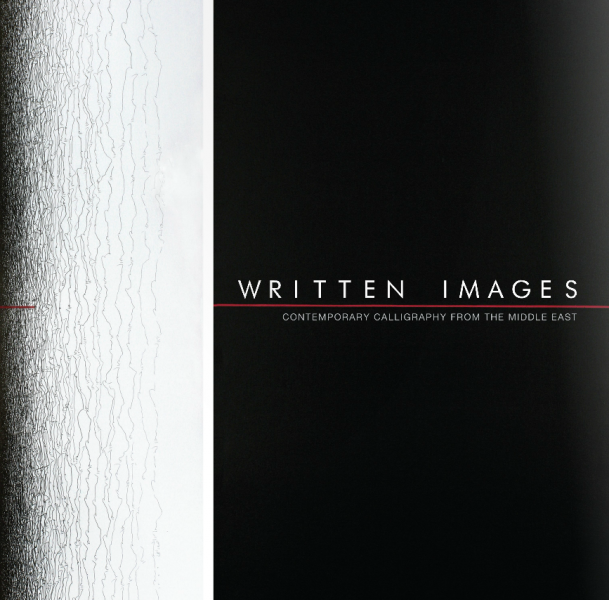 This exhibition aims to further intercultural dialogue between the Middle East and beyond. 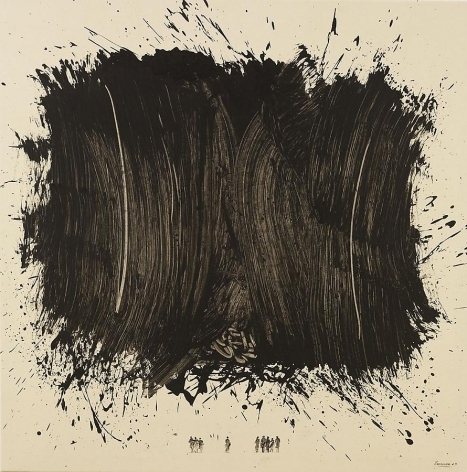 It follows on the success of Signs: Contemporary Arab Art, mounted at Sundaram Tagore New York in 2009 and Sundaram Tagore Beverly Hills in 2010, as well as Written Images: Contemporary Calligraphy from the Middle East at Sundaram Tagore New York in 2011. These shows were curated by Karin von Roques, who studied and lived in the Middle East over the past decade. As such, she has an intimate and unique understanding of the region and its artists. This show sees her throw into relief the wide range of work emerging from the contemporary Middle East, bringing its seminal artists to an international audience. Yousef Ahmad (Qatar), Lulwah Al-Homoud (Saudi Arabia), Khaled Al-Saa’i (Syria), Chaouki Chamoun (Lebanon), Ayman El Semary (Egypt), Golnaz Fathi (Iran), Hakim Ghazali (Morocco), Ali Hassan (Qatar), Georges Fikry Ibrahim (Egypt), Rachid Koraïchi (Algeria), Nja Mahdaoui (Tunisia), Hassan Massoudy (Iraq/France), Ahmed Mater (Saudi Arabia), Ahmad Moualla (Syria), Ahmed Moustafa (Egypt). Karin von Roques is a noted German curator and art historian who, having studied Islamic art, specializes in contemporary Arab and Iranian art. She is an authority on the Middle East and its culture and has garnered much praise for exhibitions on modern calligraphy of the Arab world. From 1997 to 2000 she was director of the Hermann Hesse Museum in Lugano, Switzerland. She has curated exhibitions for numerous institutions, including the Museum of Applied Arts, Frankfurt; Kunstmuseum, Bonn; Institut du Monde Arabe, Paris; and the Cultural Foundation, Abu Dhabi. She has had extensive experience developing Arab art collections, and currently oversees Deutsche Bank’s collection program focused on contemporary Arab art. She also works as a curator of Arab and Iranian artists for the famed Porcelain maker Meissen. She is a consultant to Sotheby’s, London, advising their Modern and Contemporary Arab and Iranian Art Department.